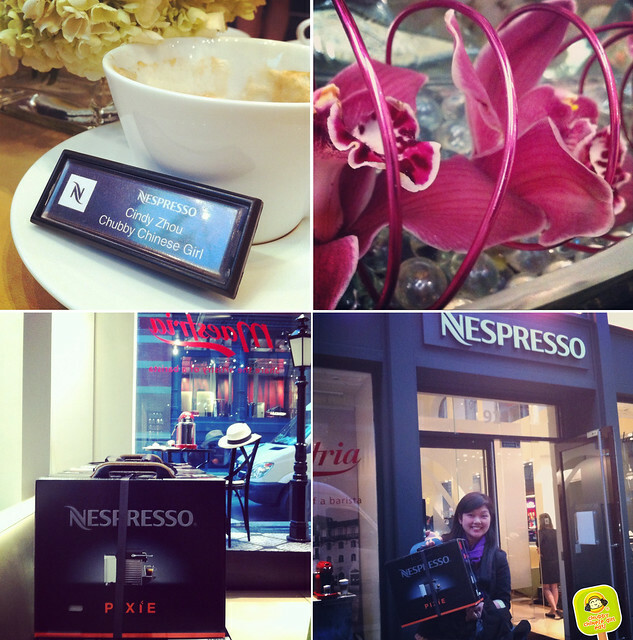 I’m no stranger to Nespresso and their events. When they launched the PIXIE machine, I was delighted to be given one and use all the time. I’ve become such a big fan, that I’ve told all my friend and family to get one. Nothing like that aroma of coffee at home. While waiting for our “flight”, we mingled with coffee dusted nuts and truffle popcorn. The cocktails were java inspired Nespresso Martini and Nespresso Mojito. I liked the rich martini better but the mojito was quite refreshing. After “boarding” our food gave us a peak of the places we were about to visit on this trip. Curry potatoes on naan, a mini arepa and empanada, plus a side of veggies. The Indriya from India had a spicy note, the Rosabaya from Colombia was more on the nutty/honey side (my favorite), and the Dulsao from Brasil had that fruity aroma with just the hint to sweetness left on the palate. 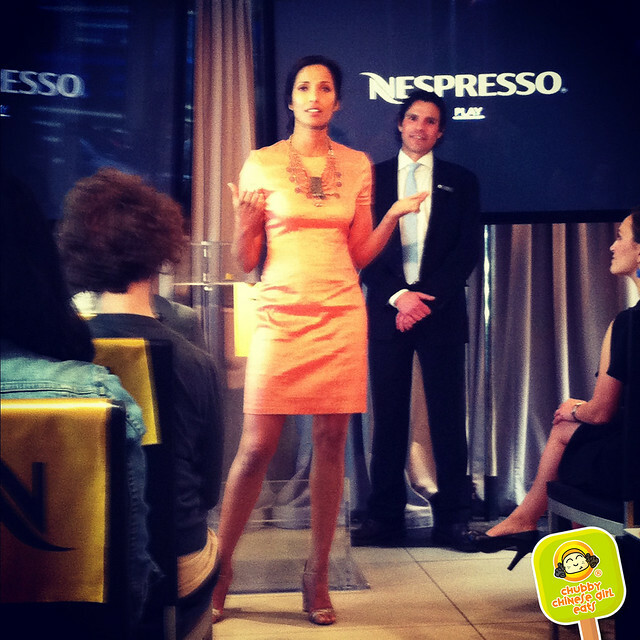 After “landing”, we were greeted at the gate with coffee/chocolate bites and Padma Lakshmi’s Signature Recipe “Nespresso Vanilla Coffee with Caramel Milk Froth. Very yummy and so easy to make. With the Nespresso machine and their Aeroccino (milk frother) this is something you can whip up in no time. The aroma of the coffee is lusciously sweetened by the creamy vanilla ice cream, airy pillows of milk, buttery caramel and some melt in your mouth chocolate pieces. At “baggage claim” we were each sent home with a Pixie Machine, an Aeroccino and all the Nespresso coffees from around the world to experience. Plus a luggage tag (cute). At home, I took out all my “souvenirs” from the trip. I can’t wait to try all the different flavors and aromas. The rainbow of these beautiful pods are so pretty, great for decoration. 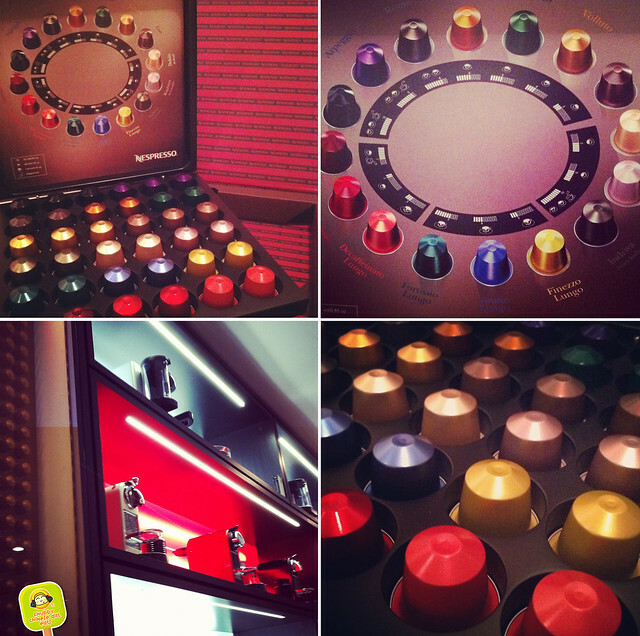 Thanks again Nespresso for a fun night (the theme was very cute). Not everyday do I meet a group of individuals who love their brand and job this much, but then again, how could you not, having a Nespresso at home is really an awesome treat!